Susan Burns, of the design consultancy company Susan Burns Design in Hamilton, Ontario Canada, is well known for helping her clients transform their homes into comfortable and inspiring spaces. Susan masterfully layers texture, pattern and color to achieve an elegant, enduring design that is both comfortable and classic. I first became aware of designer Susan Burns' amazing talents through Robin Stubbert, interiors and lifestyle photographer. Robin shoots features for magazines and books nationally and internationally. 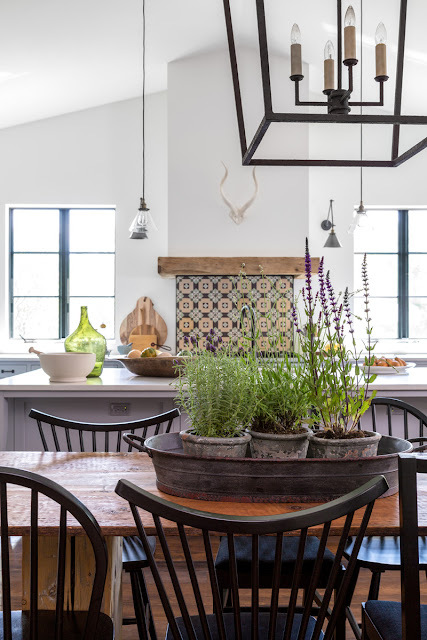 The photos featured are Robin's shoot of a renovated heritage cottage by Susan Burns, and featured in House and Home Magazine. 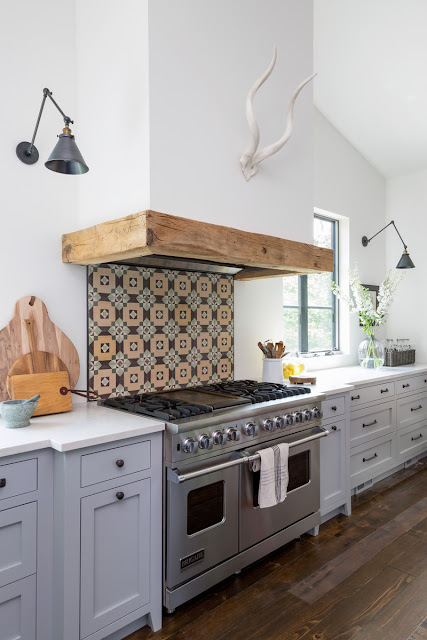 The overall palette was inspired by the vividly patterned vintage Egyptian cement tiles Susan came across at an antique shop and used for the backsplash, which really sets off and brightens the kitchens. 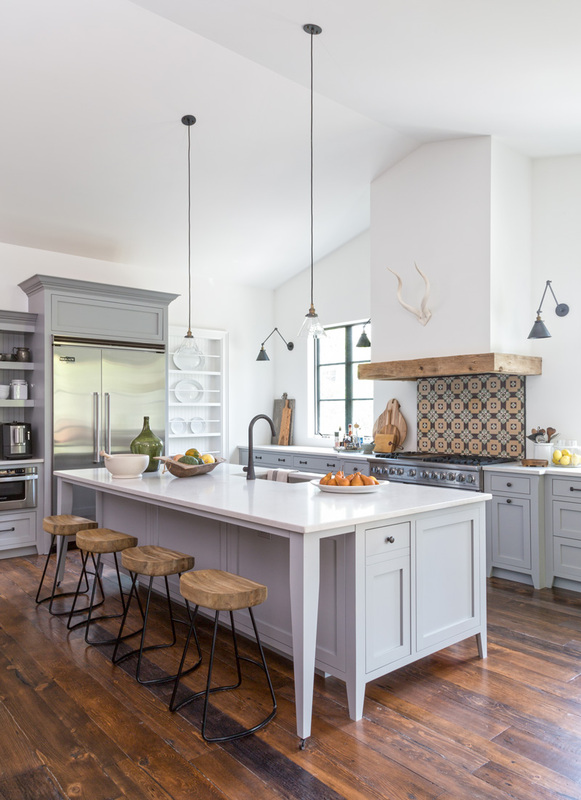 The reclaimed pine floors bring a dimension of warmth to the vintage Shaker cabinets, painted Museum Piece (CSP-40), Benjamin Moore. 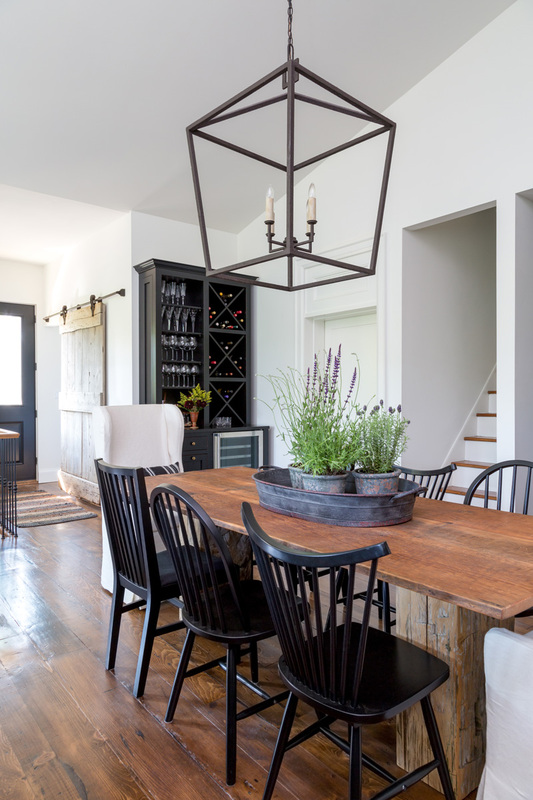 The pendant lights, sconces and stools are RH Restoration Hardware. Susan Burns Design described the Heritage House project as a large family home renovated "to blend the Victorian-architecture aesthetic with function for a large family who loves to entertain. 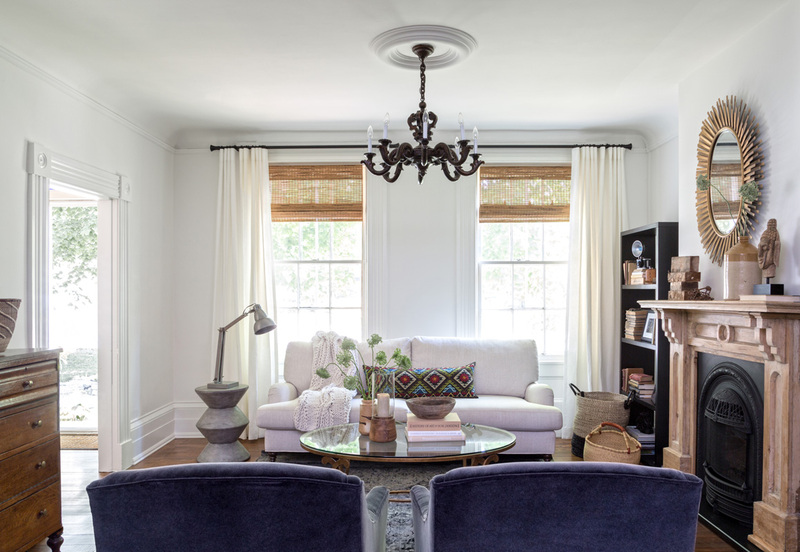 The historical charms meld beautifully with contemporary elements and to create a comfortable, modern home." 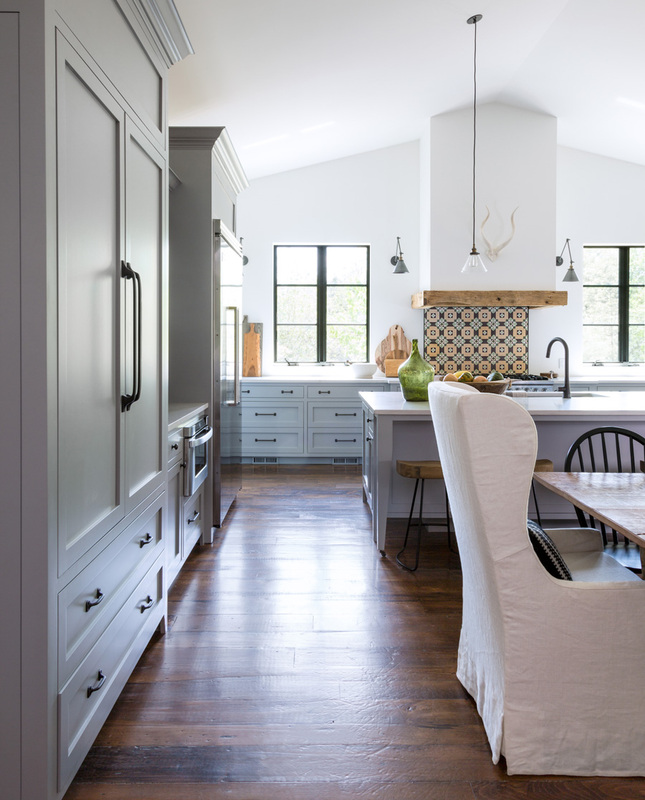 Susan's meticulous attention to detail creates living environments that truly reflect her clients' lifestyle, character, "and stories of people who inhabit them." This reclaimed fireplace, another vintage find, was stripped to its worn wood and is the perfect focal point in the living room. 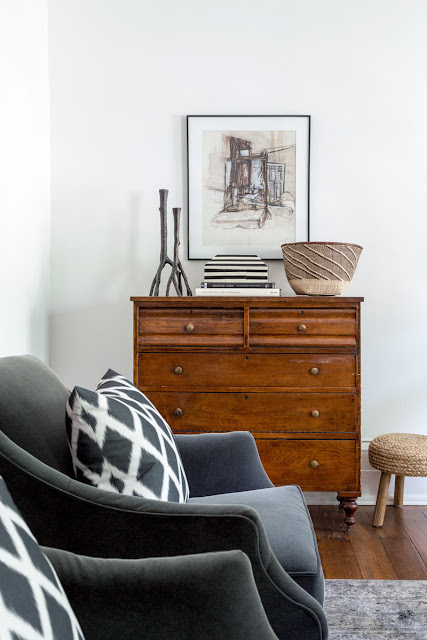 Susan balances old and new with a mix of simple lines, neutrals, warmth and light for an inviting and comfortable space. And there's always a touch of sophisticated elegance! I love the contrast of the vintage dresser juxtaposed with the newer modern pieces. 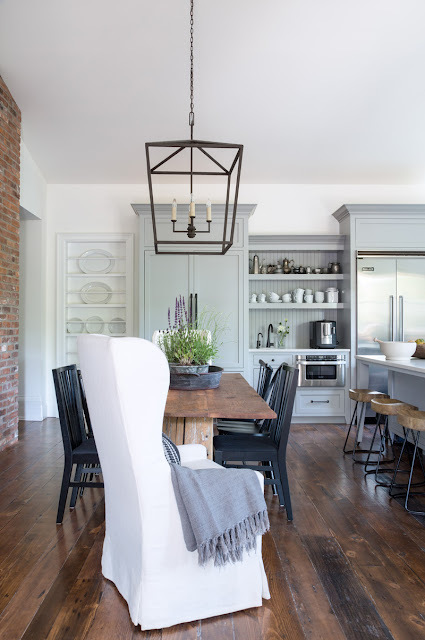 The velvet charcoal-grey chairs are stunning! 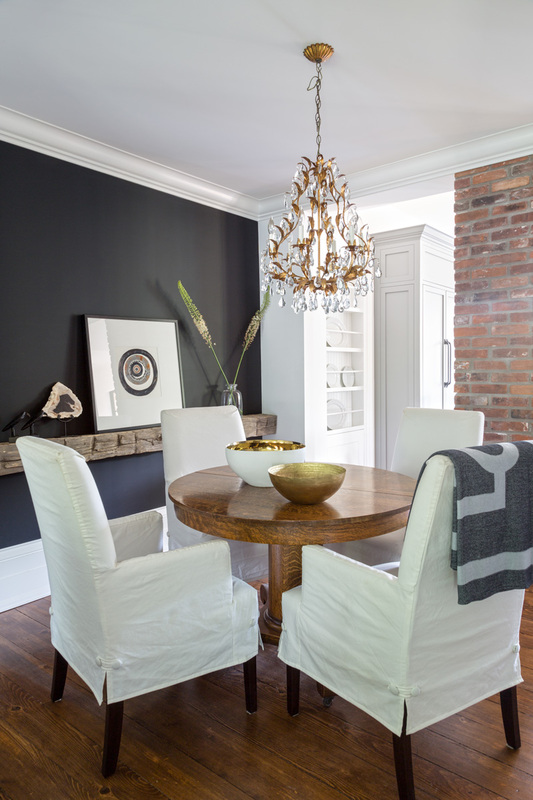 An accent wall painted black adds a contemporary, elegant feel to the dining space, while a hefty reclaimed beam used as a display shelf adds texture. 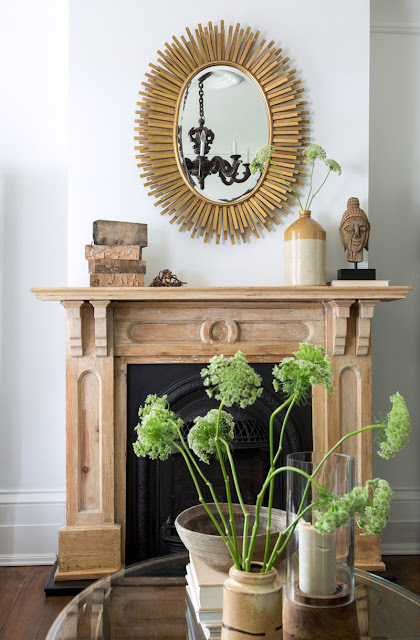 Likewise, reclaimed bricks add an edge of textural character - all masterfully layered to perfection. I love the elegant chandelier. This space is perfectly balanced. 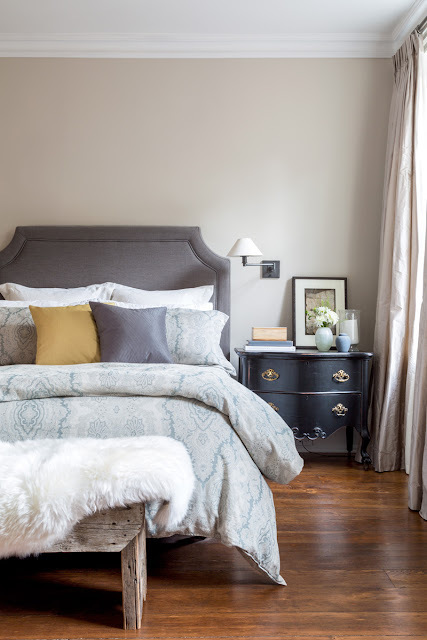 The same color palette is carried throughout the home for an overall simple, relaxed and serene feel with touches of sophisticated elegance. It's a beautiful home! Thanks for visiting today! I hope your week is going well! Absolutely delightful read. 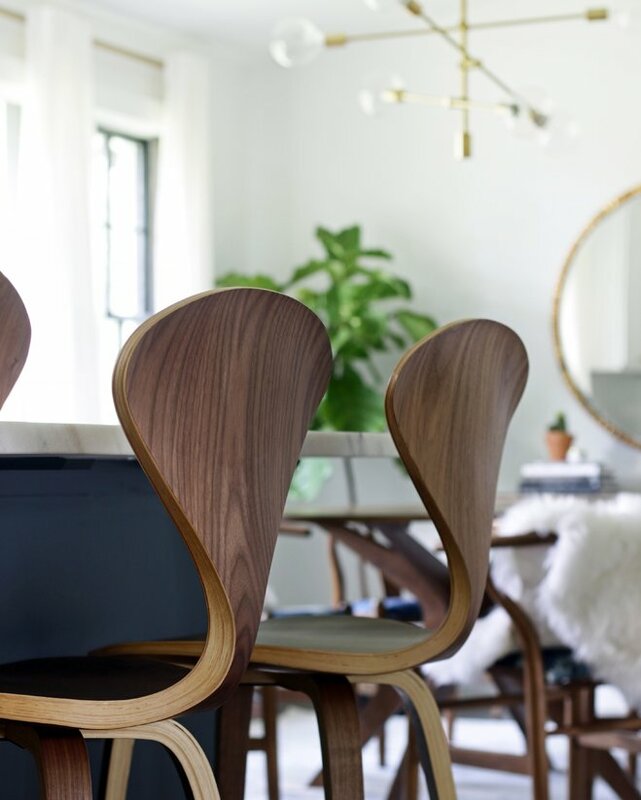 Those dinning room chairs are gorgeous. Where could one find those or a similar style? If you’re still interested, the chairs you inquired about can be found at Restoration Hardware.